A pledge to solve human need without discrimination has put The Salvation Army up against a killer disease in Sri Lanka. The farmer’s face was incandescent with happiness as he gazed up at the two-story structure built on land he had given away so that other lives in his village might be saved, if not his own. For Lathpana Thilakaratne, 60, had not long to live. The scourge that has the world scrambling to find its cause had him in its death-grip. It takes two lives a month in his village, Damsopura, off Polonnaruwa, Sri Lanka. Chronic Kidney Disease (CKD) is the fastest-growing killer since HIV/AIDS and although in affluent societies it is linked to diabetes, in poorer communities the causes are unclear: the common denominators are farming, heat and poverty. Sri Lanka’s North Central Province is a global hotspot for CKDu (the “u”standing for unknown origin). There is an emerging epidemic of death among younger adults in Sri Lanka due to CKD of unknown or mixed causes, the Global Burden of Diseases study reported last year. Diagnosis is often a death sentence because CKDu is a quiet killer. Chronic Kidney Disease (CKD) is the fastest-growing killer since HIV/AIDS and although in affluent societies it is linked to diabetes, in poorer communities the causes are unclear: the common denominators are farming, heat and poverty. Sri Lanka’s North Central Province is a global hotspot the disease of unknown origin. CKD symptoms often become noticeable only by Stage 4, but by then almost three-quarters of the body’s kidney functions have closed down: the body is filling with unflushed waste, the brain cells and tissue are poisoned and the victim lives in dread as his heart beats unevenly, breathing becomes difficult and he grows lifeless. Stage 5 is the end-stage, with death coming within weeks. Male farmers are the main victims, and the World Health Organization believes more than one in 10 of the North Central Province population has CKD. Only three out of every five victims will still be alive in two years, Meththasinghe said. This year Sri Lanka pulled high-tech foreign resources into the struggle to discover the cause of CKDu, with the Australian Nuclear Science and Technology Organization’s Synchotron and Centre for Neutron Scattering offering assistance. Until the magic bullet is found, early detection is a must and safe water is key to survival. Yet both factors are out of reach for many in the district’s remote villages. They live far from help, breathing a mist of arsenic, lead, cadmium and mercury from agro-chemicals used in vast quantities that have poisoned their soil and groundwater. Enter an unlikely player: The Salvation Army in Sri Lanka. Four years ago, the organization decided to partner with Sri Lankan bodies in the Polonnaruwa District “to meet human need without discrimination,” according to its mission statement. That resolve was put into action after a surprise visit to its headquarters by NCP Councillor Amarakeerthi Athukorale in 2013. “He was so concerned about the high rate of kidney disease in his area that he came to Colombo to ask us for help,” said Salvation Army Sri Lanka Communications Officer Major Peter McGuigan. Athukorale had seen The Salvation Army working effectively in past disasters. Call it divine providence, but around this time the Canada and Bermuda Territory contacted Colombo and said it wanted to invest heavily in the welfare of Sri Lankans in need. Could funds be put to good use? Then the USA Western Territory decided it also wanted to contribute. With these funds, The Salvation Army has made a difference in the lives of thousands of people in the Polonnaruwa District in just two and a half years. The money from Canada is being spent to build 15 “safe water” community wells with super-efficient filtration units. Eight of the two-story structures are completed so far, providing safe drinking water for more than 8,000 villagers. Two others are almost finished. 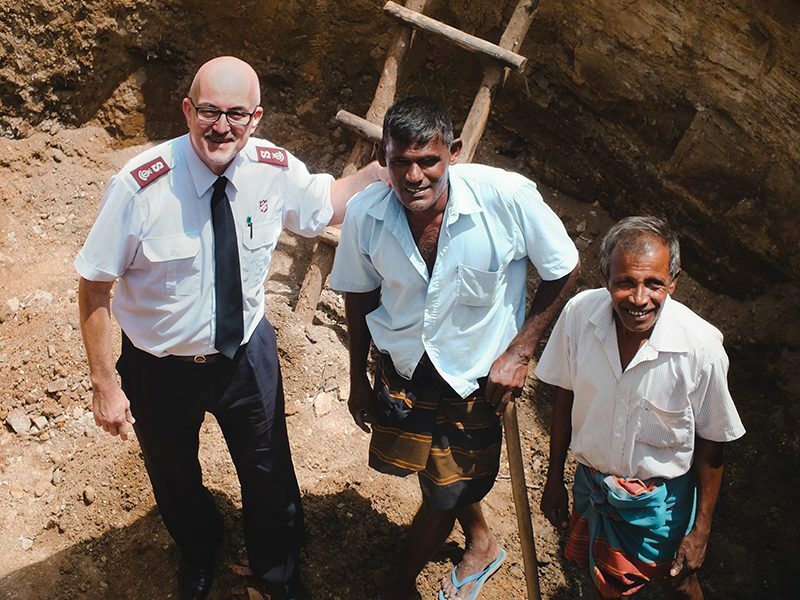 The Salvation Army’s Communications Secretary in Sri Lanka, Major Peter McGuigan, joins workers to get a first-hand look at the Elahera-Ihakuluwewa community safe water project, now under construction off Polonnaruwa. The story of how The Salvation Army is going about its work is as compelling as the work itself. It must contend with poverty, ignorance, hostility toward Christian organizations that use charity to win conversions and cynicism about city folk who come and promise lots but don’t deliver. The “Salvos” are earning trust, McGuigan said. Of the eight wells so far completed, three are on plots donated by local farmers, a demonstration of faith in the work. The organization relies heavily in Polonnaruwa on Salvation Army soldier Dinuka Rajapakshe and his wife, Rasangika Rajapakshe. Dinuka Rajapakshe works to get villagers on board because each project is a self-sustaining community endeavor. With advice from the Water Board he selects a village in most need of help—in some, residents had to walk over three miles a day to fetch drinking water—and an initial meeting is held with the local MP, Divisional Secretary, grama niladhari and the village samithiya (society). When the samithiya questions The Salvation Army’s motives, the team displays documentation and film of previous projects. A committee of 10 villagers is chosen to explore the issue. Next the committee is invited to meet a similar committee at a village that has already received a well. 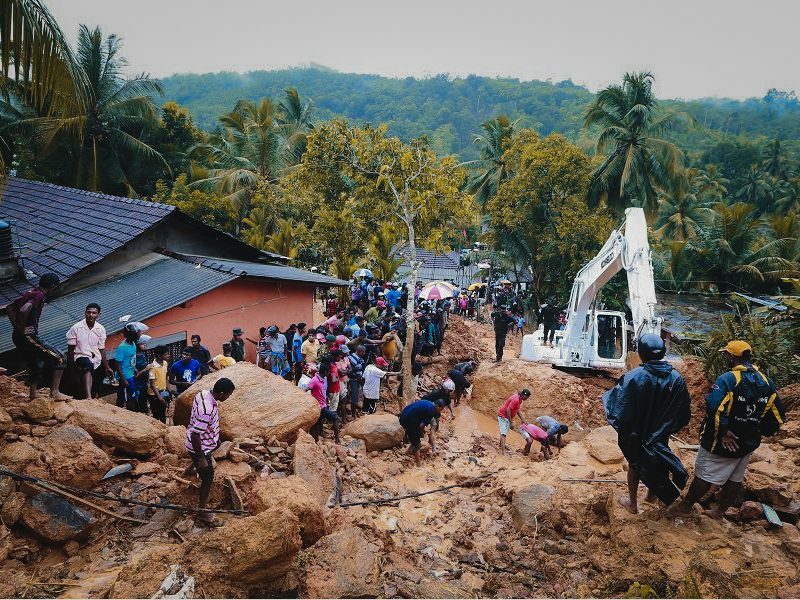 “After that, The Salvation Army team steps back and lets the two village committees talk together and decide whether to come back to us,” Rajapakshe said. 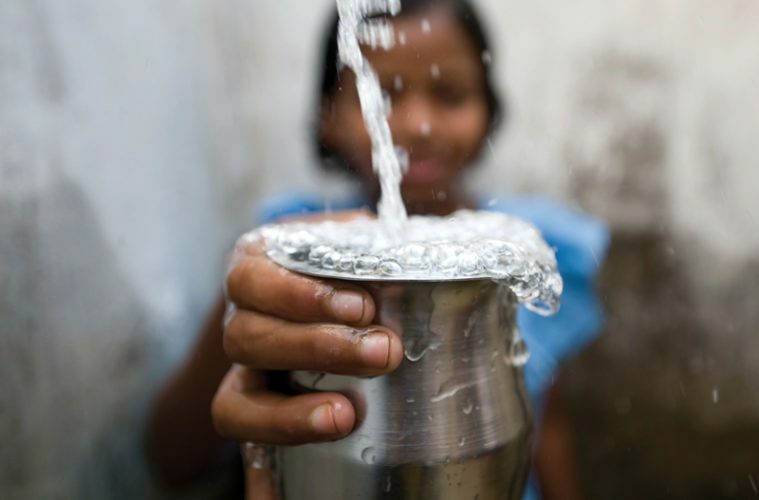 Once the village has met and approved a well-water purification plant—with painstaking honesty and transparency communicated by Rajapakshe—The Salvation Army hands day-to-day control of the project to the samithiya to contract labor for the project and keep accounts. When the well is built, water is sold at roughly 3.8 Sri Lankan Rupees (roughly 0.02 cents USD) a gallon (though those most in need get it free) and the proceeds are banked and used for upkeep and employment seed funding. One samithiya has collected 200,000 rupees (about $1,307), which it is using to fund repayable microfinance loans to families in need. The well quickly becomes a community hub where people share their lives and tell their stories. Meanwhile, Rasangika Rajapakshe travels throughout the Polonnaruwa countryside with staff from The Salvation Army’s Mobile Medical Clinic, established with the funds from the USA Western Territory. The Salvation Army mobile screening unit—there are two others run by the government—has screened about 20,000 people since 2014 and found more than one in 20 have CKD. In Welikanda village, for example, a young farmer, 29, was screened and had Stage 4 kidney disease. He died eight months later, leaving his wife to work and his eldest daughter, 13, to stop going to school to look after the two younger ones. The Salvation Army began holding night clinics to accommodate farmers who work during the day—400 men came to the last one—and couples poverty-alleviation programs with the mobile clinics. The Army helped one family with bakery equipment to help the mother expand what she could make to sell in town, money that helped the family make a down payment on a cart to take the bakery goods into town. They are now saving money to set up a bakery. Such stories are why Rasangika Rajapaksha joined The Salvation Army. “Before I married Dinuka I didn’t like this kind of work,” she said. Then she watched him help survivors of the 2004 tsunami. In Damsopura last December, Lathpana Thilakaratne joined Athukorala and other dignitaries to ceremonially declare open the safe water well built on land he, a poor farmer, had donated. “Tears were running down his face,” McGuigan said. He knew he was dying but heard about the wells and wanted to donate land so he would die peacefully, knowing his family and neighbors would be looked after, said Dinuka Rajapakshe. Excerpted from a story published in The Sunday Times, Sri Lanka. Republished with permission. Dinoo Kelleghan is a writer for The Sunday Times, Sri Lanka.